This year has been overwhelming and exciting and it’s probably been the most varied one so far. 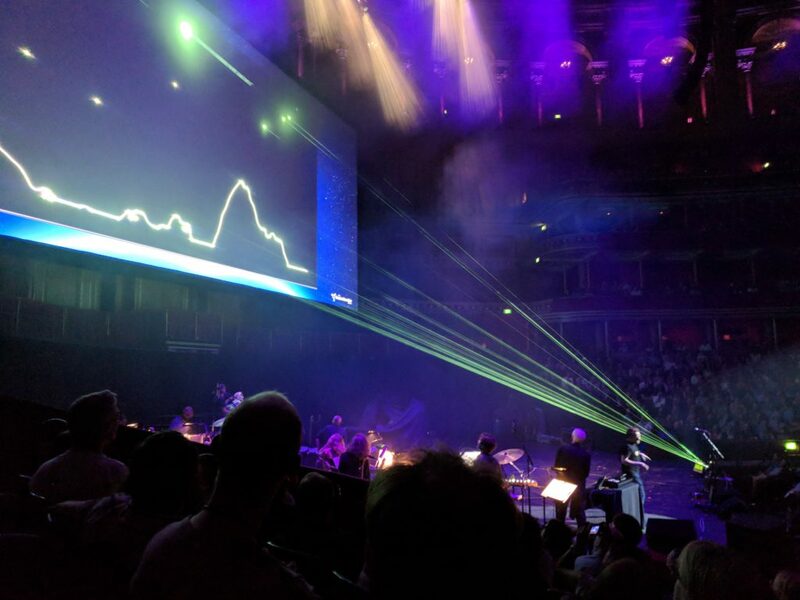 The stand-out experience was at The Albert Hall for Space Shambles where I shared the stage with an actual Apollo astronaut who played a massive version of Lunar Lander, laser projected onto a 25m wide screen. 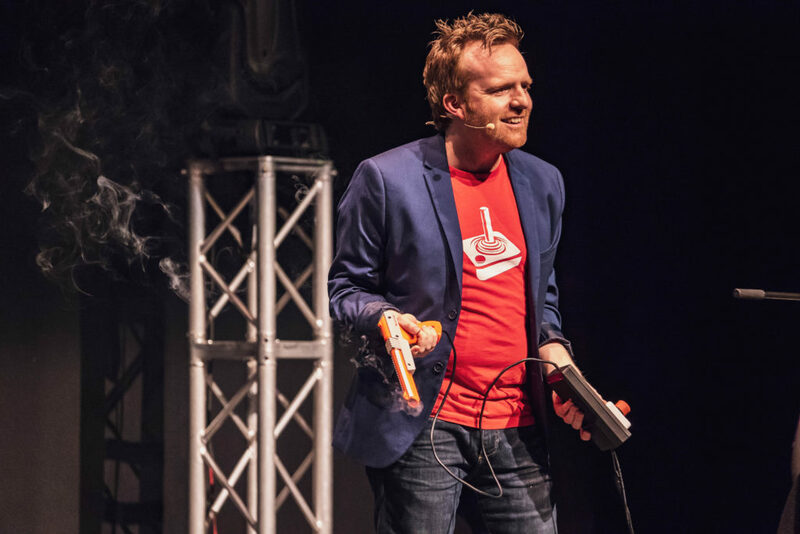 But there have been many other highlights too – I performed a short run of my solo geek comedy show Hacked on Classics, went on tour with interactive dance show Choreocracy, and took Mindfulness Machine to TIFF in Toronto. But let’s start with what seems to be defining my career lately – lasers! My own open source laser control code base has been growing in capability and reliability. The underlying controller code has been optimised, and it can now easily handle multiple lasers (an upcoming project in January 2019 uses 8!). Other capabilities added this year; complex warping functionality (for architectural mapping) and a graphic object that allows for vector occlusion. 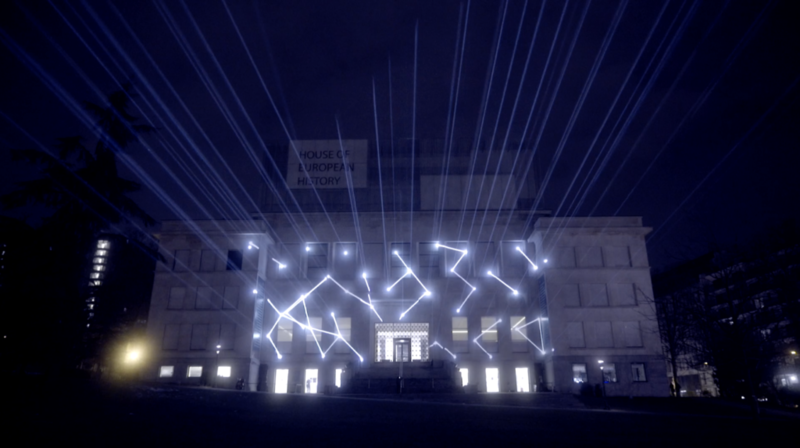 A couple of interesting collaborations this year, in March, I teamed up with artist Joanie Lemercier to produce a laser projection project at The House of European History in Brussels. Flux by Joanie Lemercier, lasers by me! And in August, I teamed up with comedian Bec Hill on her new show I’ll Be Bec at the Soho Theatre in London. It’s a fantastic time-travelling sci-fi comedy show that she’s hoping to take to Edinburgh in 2019. Unfortunately my contribution to the show is somewhat of a spoiler, but suffice it to say it was such a pleasure to work with Bec and the team, and it’s worth checking out her show if you can. Such an incredible experience deserves its own sub-heading! In June, Robin Ince and Commander Chris Hadfield put on a spectacular space-themed cabaret show, Space Shambles, at the Albert Hall. The amazing line-up included my friends from Festival of the Spoken Nerd and musicians Grace Petrie and Laura from She Makes War, as well as the best and brightest science communicators in the industry. In my section, I introduced the arcade game Lunar Lander, and replicated it with lasers. 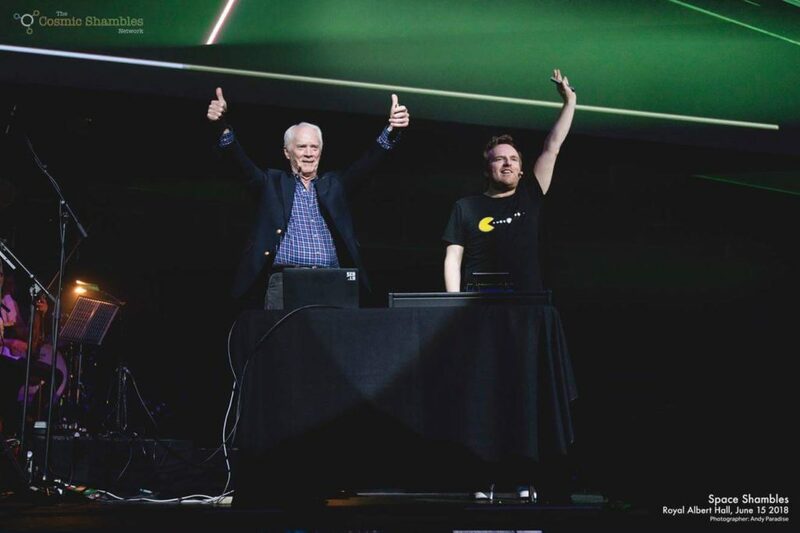 “Some people say the original game was so difficult that it was as hard as flying an actual Lunar Module… but there’s only one way to find out…”, at which point (and I still can’t quite believe this) I introduce Rusty Schweickart, the Apollo astronaut who was the first to test drive the real Lunar Module. He of course was cool as anything as he gently touched down the laser generated Lunar Lander, and of course, the crowd of 6000 erupted into applause! As a confirmed space enthusiast, it was probably the highlight of my career so far. I’m really hoping that I can take Laser Lunar Lander out next year to celebrate the 50th anniversary of the Apollo moon landing (and the 40th anniversary of the Lunar Lander arcade game!) If you can think of any opportunities or big buildings that could do with a massive laser version of a 70s arcade game, let me know. The Albert Hall show was just one of many stage appearances for me, and it’s something I’m really enjoying these days. A booking from The Lowry for their Week53 festival was the incentive I needed to update my solo geek comedy show Hacked on Classics. I worked with a producer and comedy director Chris Head to help give the show a semblance of narrative structure and bring out the humour. But as well as that, I also made several appearances at An Evening of Unnecessary Detail, my favourite nerd comedy night in Bethnal Green. Early in the year I was a guest at several MathsFests, a show for young maths students. And the end of the year was finished of with Nine Lessons and Carols (where I played a Christmas song on a keytar made of floppy disk drives) and the wifi wars Christmas special at the Royal Institution. Also in December I was part of the BBC Click live show, where I showed off one of my new lasers. It was great fun, a really nice team, and I hope to do more with them next year. It seems that much of my work this year has been in theatres and Choreocracy is no exception. Working with choreographer Tim Casson, we have put together an interactive dance show that you control with your mobile phone. It’s a lot of fun, and we toured with it in November and December. We’re touring again next year more details at choreocracy.com. A couple of years old now, but Mindfulness Machine made it to the DigiPlay exhibition at TIFF in Toronto, and then straight to the O’Reilly AI conference in New York. As well as the aforementioned floppy disk drive keytar, there were several other making projects this year. I made some radio controlled light-up shoes for Choreocracy (using bespoke PCBs, Adafruit feathers, 3D printed enclosures). I also have continued work on a home light installation based on something from the movie Ex Machina – I started it a few years ago but got busy on other projects. I got myself a Glowforge laser cutter in the summer, and this was just the excuse I needed to finish laser cutting all the parts. 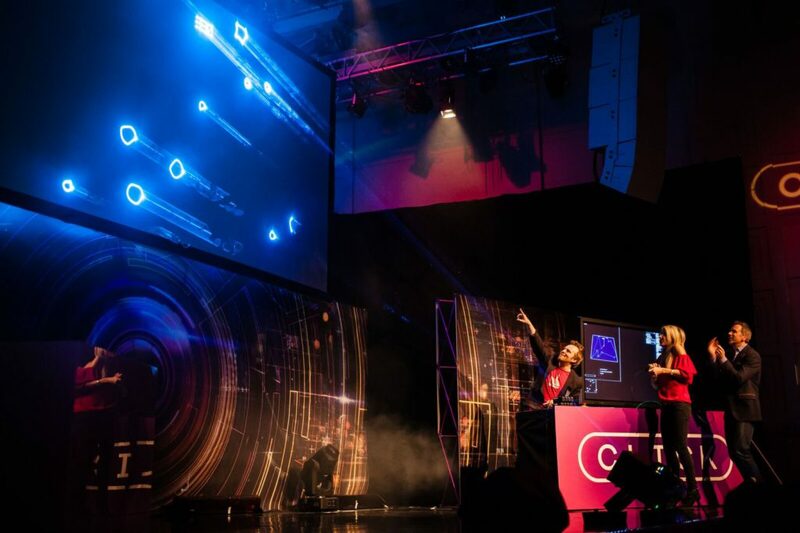 I spoke at a few conferences, including Smashing in Toronto and Freiburg, I ran a glow-stick band performance for my friends at Westvisions in Germany, I did a last minute TEDx talk in Surrey. I spent the summer experimenting with 3D printing finishes (including coating resin) and I also took photos for Belongcon and FFConf. This year, I feel like I reached the limit on the number of large installations I can organise, so next year I’m hiring Cat Hunter to help me promote and produce those events. 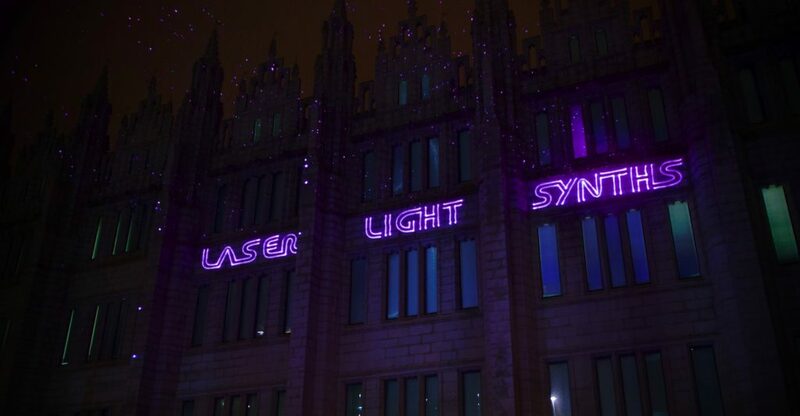 But it’s already off to a good start – I have a booking for Laser Light Synths in January at Middlesbrough Town Hall that will have the most lasers I’ve ever used! And to help with the promotion of those events, I’m going to be breaking off my professional identity into a new brand and website (eventually at seblee.co) and keep this as my personal site, for random thoughts, project updates, and personal appearances / speaking engagements. I realise that I have hardly blogged at all this year. I’ve got out of the habit, but it’s something I’d like to restart again. 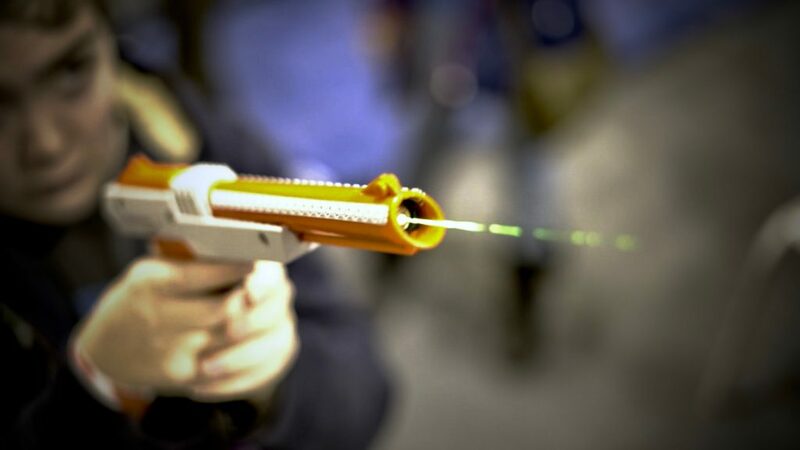 There are so many guides I want to write about using lasers, openFrameworks etc. I’m struggling at the moment with social media and the state of the world. Brexit is a huge depressing thing that’s hanging over 2019, and will likely be very damaging for myself and this country. But I feel truly blessed to have such a great and varied career. As long as people need joyful experiences, I’ll be here to provide them. After 5 years of working with lasers, it seems that I have now been accepted by the wider laserist community! The International Laser Display Association (ILDA) have honoured me in their awards ceremony in Montreal, as part of their annual conference. My awards are in their Innovative and Art category, second prize for Lightning Catchers and first prize for Lightning Strikes! I thought I’d give LSX a try – it’s pretty cheap and seems like fun laser software. I had some trouble installing it on Windows 10 – kept getting the message “Code execution cannot proceed because msvcp100.dll was not found”. It seems to be a problem with Visual C++ apps, and I found the solution on this post – you have to install the Visual C++ redistributable package, download here. I’m not sure if this is a Windows 10 specific thing but hopefully posting this here might help. I’ve been really frustrated that my favourite keyboard shortcut to toggle display mirroring doesn’t work on TouchBar MacBooksso I’ve made a button that can emulate it! That’s it! It should be way less than $20. You’ll also need a soldering iron. Solder the switch to the Trinket as in the pictures – you’ll need to break one of the legs off. Then you’ll need to install the Arduino IDE, and add the Adafruit boards. 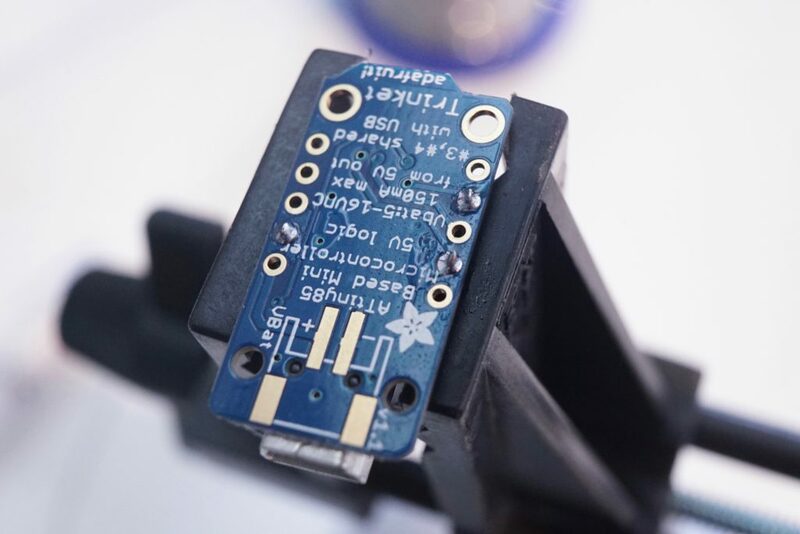 Checkout Adafruit’s brilliant guide to installing the Arduino IDE for their boards. Download the code from the Cmd-f1-emulator repository on GitHub. In the Arduino IDE, open the preferences and change the sketchbook folder to be the ‘Arduino’ folder inside the repository that you just downloaded. Restart the IDE, and then open the file CmdF1Emulator from the sketchbook. 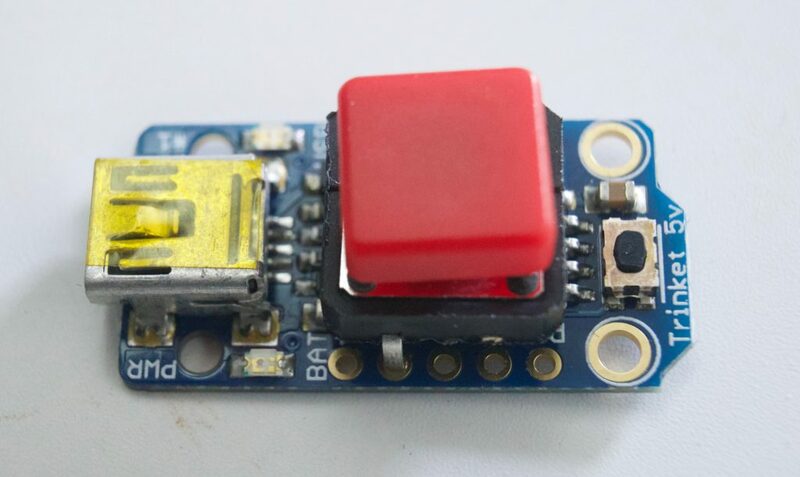 Make sure that the correct board and programmer are selected (Adafruit Trinket 8Mhz and USBTinyISP, respectively – check the instructions on working with the Trinket on Adafruit if you’re new to this). Press the reset button on the Trinket and upload the code to it. It should now work! It uses the Keyboard Trinket code provided by Adafruit, although I had to adapt it – apparently the Mac doesn’t act on the keyboard shortcut unless it thinks it’s made by Apple. That was a day wasted trying to figure that out! I adapted the Keyboard Trinket library to provide an Apple USB device ID to fool your computer into thinking it’s an Apple keyboard. 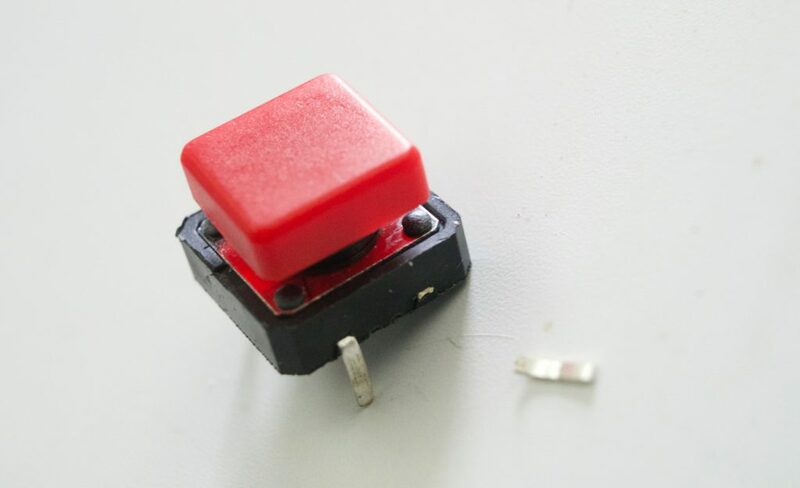 Ideally you should really put it in some kind of case – maybe just wrap it in Sugru? Or else there are some Trinket cases on Thingiverse you could check out. Let me know if you decide to make this simple project and how you get along! It’s kind of a niche requirement but very important for someone like me who runs presentations with keynote split on two screens to running demos that need to be mirrored. 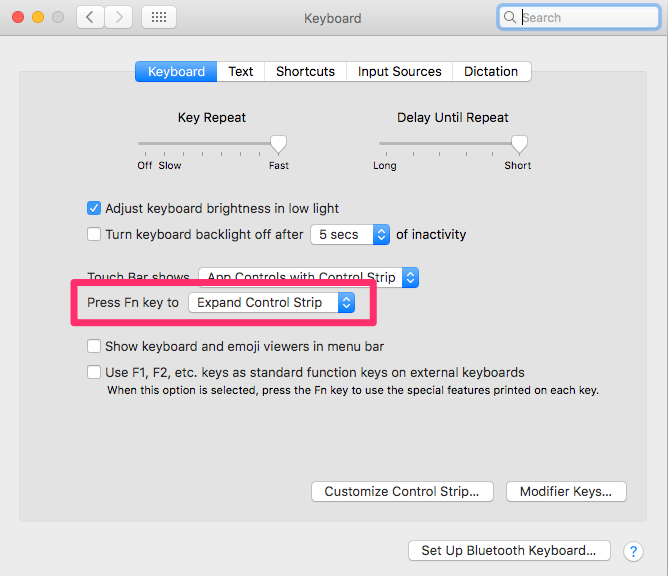 It was always Cmd-F1 on any non-touchbar equipped Mac, but sadly that stopped working on the new Macs, even if you hit the fn key to make the function keys appear. I went as far as creating a hardware keyboard emulator, before I discovered this software solution (thanks Anders Anker!). Hit Fn-Cmd and the decrease brightness button on the touchbar. If you’re interested, here’s the post with full instructions on how to make the hardware version. As part of the preparation for my upcoming workshops (last two tickets left!) , I’ve been working on writing Node.js code to drive various bits of hardware that are included in the free kit that comes with the course. So I’ve made my first ever npm package! And it drives cute LED displays running on the MAX7219 chip. In particular, there are two little LED displays that I really love. One is an 8 x 8 LED matrix, and the other is an 8 character 7 segment display. (The ‘7 segment’ refers to the arrangement of LEDs that makes up the number shape – think of the displays on the Delorean time-machine dashboard). They’re both driven by the same chip, the MAX7219, which can drive 64 LEDs, so perfect for both of these displays, and you can actually daisy chain up to 8 of them together and run them from the same pins. 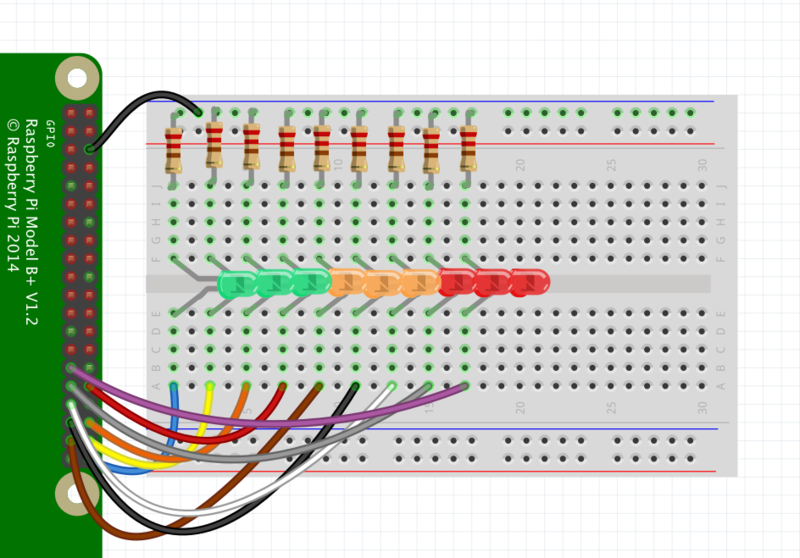 There is already a Node.js library that can run these, and it works fine (MAX7219) – it’s geared towards the 7 segment display and it works with the native SPI device on the Raspberry Pi. But it is possible to run a MAX7219 chip without using the SPI device. You can ‘bit-bang’ the GPIOs – this is a way of sending digital data out of pins manually by setting them to high or low for each bit. 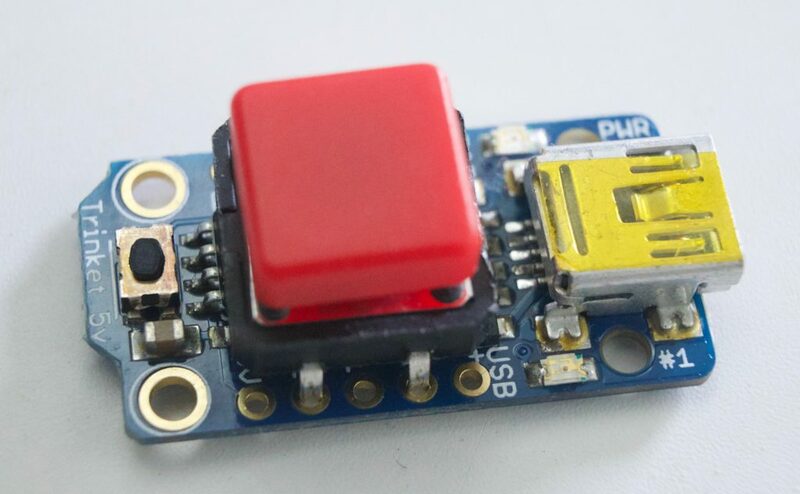 It’s probably more performant to use the native SPI device but this method is perfectly fast enough for most applications, can be connected to any pins, can have multiple outputs, and is simpler to set up (as you don’t have to enable the SPI device on the Raspberry Pi). 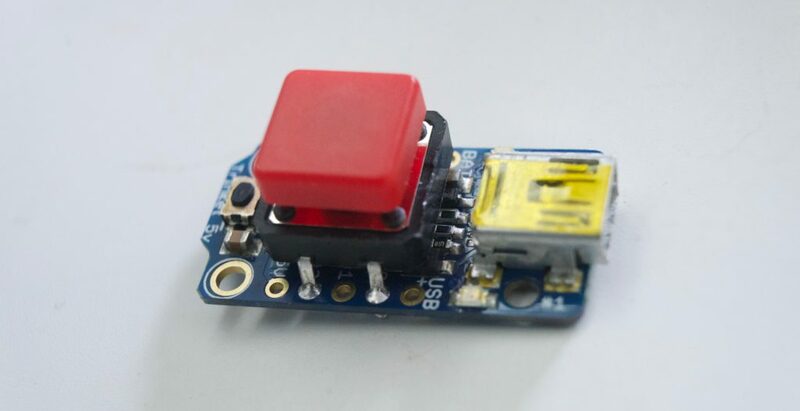 It’s based on the Arduino LedControl library so much of the API is similar, but it’s currently in a very early state so expect the API to change. See the github page for more details. Today I wanted to get this ultra-thin LED matrix working with Raspberry Pi in NodeJS as part of my work on my new ST4i workshop. 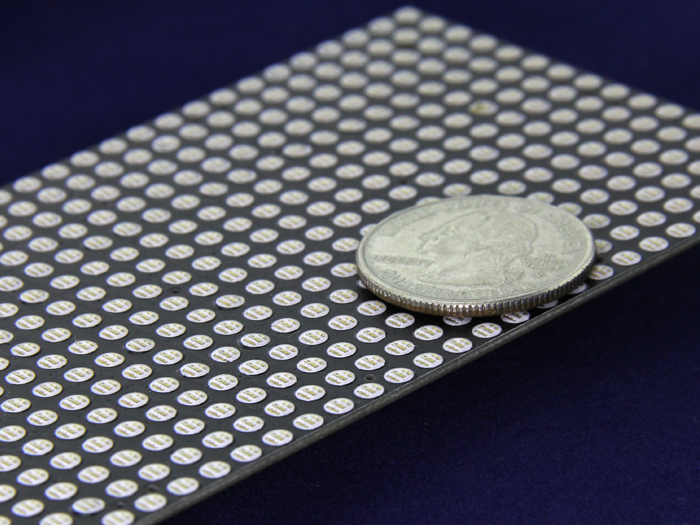 The SeeedStudio Ultrathin Red LED matrix. It’s such a nice bright matrix, I really love it, but they’re a little weird to work with. They use the HUB75 protocol which scans across the screen doing a few pixels at a time, so they tend to look super flickery on a standard slow Arduino. But there’s this C++ library for Raspberry Pi that is way faster and some nice person has wrapped it in a Node.js module. Although I got the C++ code working, I couldn’t install the Node module – the compilation process failed. After some exploration, I realised that the module was designed for older versions of Node (I think a maximum of 0.12.0) and I’m running 5.4.1. I tried to revert my Node version with n but that seemed temperamental on the Raspberry Pi ARM versions of node. I couldn’t get it working, and it didn’t feel right to switch Node versions if I didn’t have to. So plan B – I set to work updating the node module. There’s lots of documentation on how to wrap C++ code into Node addons and I have to admit, it’s pretty intense! At least for me, as I haven’t really got much experience of the V8 engine. I really should use the Native Abstractions which is a way to wrap C++ code that will remain compatible with past and future versions of Node.js, but one thing at a time. I’ll take a look at that next. In the meantime, enjoy the particles!